Looking for blue yesterday I spotted the empty blue sherry bottle in the recycling and had this idea. The phrase "just the one" comes from an old TV series which I don't remember seeing but my friends and I have often used the phrase when offered a drink - joking of course!! My sister who never drank when her husband was alive has taken to drinking a glass of sherry before dinner. Yes that is a wine glass!! Living with me has driven her to drink!! LOL!! Many thanks for visiting my project and leaving such great comments - always very much appreciated!! Lovely composition and your story made me laugh. Hope your sister didn't drink the whole bottle. Fantastic bluebottles- makes a great still life. Wonderful bottles. I think it’s lovely to have a cocktail before dinner, and my husband is alive. LOL. Superbly composed still life . 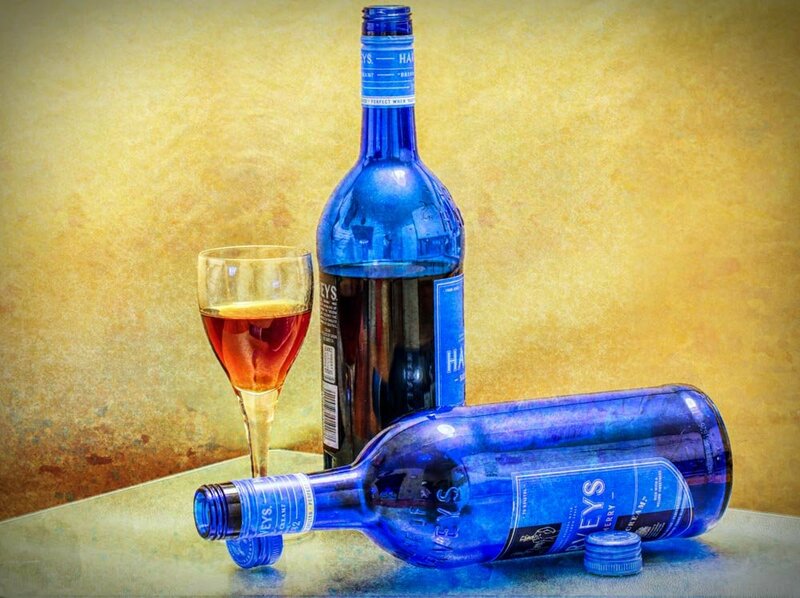 love the blue of the bottles ! Love the blue bottles! Great image! Great colours Pam, I'll have just the one please.